• The Next Justice to Go? This current episode of America's border security reality show will come right down to the wire, presumably because Donald Trump has planned it that way. In any event, on Thursday, both houses of Congress passed the compromise bills that will keep the federal government open and operating for the rest of the budget year. Donald Trump has communicated through intermediates, including Senate Majority Leader Mitch McConnell (R-KY), that he will sign the bills and then promptly declare a national emergency. Mass shootings are a national emergency, and the Second Amendment reads: "A well regulated Militia, being necessary to the security of a free State, the right of the people to keep and bear Arms, shall not be infringed." Consequently, on day one of my presidency, I will issue an executive order requiring all gun purchasers to file an affidavit with the government giving the name and address of the militia of which they are a member and then will let the courts determine if that militia is well-regulated or not. The list is really endless; the state of the country's healthcare system could be an emergency, or global warming, or the water in Flint, MI. Actually, those things really are emergencies that are taking people's lives. So, it will be easy as pie to sell in a world where a border wall was an "emergency." Not every Republican in Washington is as confident as McConnell in this course of action. At least one of them believes that the use of executive actions is "very, very dangerous," and "should absolutely not pass muster in terms of constitutionality," and is very possibly impeachable. Of course, the Republican who said those things was Donald Trump, in reference to executive actions taken by Barack Obama in relation to...wait for it...immigration policy. It's possible that the Donald has changed his opinion on this matter; someone should really ask him. Once Trump follows through on his threat, the ball will be in the Democrats' court, with Speaker of the House Nancy Pelosi (D-CA) taking the lead. She said on Thursday that she has not decided on a course of action yet, and is waiting to hear Trump's justification for his actions. She really has two basic options, though, and could pursue either or both. The first possibility would be to initiate a joint resolution that would reverse Trump's declaration. It would take a two-thirds majority in each chamber, which is likely doable in the House, and may be doable in the Senate. Either way, it would put Republicans in a difficult bind. They could vote for the resolution, but then they would be defying Trump, who currently has the GOP base in his pocket. Or, they could vote against it, but then they would be on the record as supporting the denigration of the legislature's power of the purse, and as approving the use of emergency declarations for whatever "emergency" a president cooks up. And, incidentally, this is not the kind of thing that McConnell can just bury and refuse to bring up for a vote. This sort of joint resolution is privileged, which means the Majority Leader is required to bring it before the full Senate in no more than 18 days. The alternative would be to file a lawsuit in federal court. This would, at very least, tie things up for a while. And the Democrats would have the stronger hand, arguing that Trump's action would be an abrogation of the first article of the Constitution, because only Congress gets to decide how money is spent, and it can hardly be argued they were unavailable to make that decision on literally the same day that Trump signed a bunch of spending bills. That said, Pelosi & Co. might be thinking dreamily of all the "emergencies" they might declare the next time the Democrats take the White House, and may prefer to allow Trump and the GOP to set a precedent. Maybe that "deep state" stuff wasn't completely off the mark. Former acting FBI Director Andrew McCabe sat for an interview with CBS News on Thursday (though it will be aired Sunday). During that sit-down, he confirmed that high-level staffers at the FBI talked about the possibility of invoking the 25th Amendment, and removing Donald Trump from the presidency. The conversations got far enough that the names of possible cabinet officers who might be on board were discussed. On January 20, 2017, a bit after 12:00 p.m., Donald Trump was sworn in as president. And approximately five minutes later, Trump's 2020 campaign got underway. Given that Team Trump is spending his first four years worrying primarily about his next four years, it's not surprising that their oppo research operation is already in full swing. It's not so easy to keep these things a secret, and so the data gathering has clued in everyone in Washington to the Democratic candidates that frighten Team Trump the most. There are three of them, and they are all U.S. senators, namely Kamala Harris (D-CA), Elizabeth Warren (D-MA), and Cory Booker (D-NJ). Insiders say that there is a fourth senator who will join them if he declares, namely Sherrod Brown (D-OH). It's interesting that Kirsten Gillibrand is not on the radar, given her prominence and her public battles with Trump. No Sen. Bernie Sanders (I-VT) or Beto O'Rourke, either, though it's possible that formal announcements of candidacy could move one or both up the list. Actually, that should probably be the California bear, given what's on the state flag, but we are unaware of anyone who has "bear tamer" as their job title (well, outside of Warhammer). In any case, the Golden State has moved its primaries near the front of the calendar this year, which means California is actually an important part of the nomination process for the first time in a long time. With its rich trove of roughly 500 delegates, the various Democratic candidates are licking their chops, while also trying to figure out exactly how to proceed. Northern California is quite different from Southern California; in particular, the latter is more centrist, has far more people, and Latinos make up a much larger percentage of the population. The coastal areas, which are home to most of the pinko commie types, are quite different from the inland areas, which skew more conservative. To paraphrase James Carville, it's San Francisco/Marin Counties up north and Los Angeles County down south, with Texas wrapped around them. Orange County is another pickle. Is it really blue now? Or is it just reddish-purple and cranky with Donald Trump? The state's early voting will allow candidates with solid data operations to read the tea leaves and fine-tune their messaging heading into Election Day. The state's recently legalized "ballot harvesting" laws will give an advantage to candidates with a strong ground game. The Next Justice to Go? Between Ruth Bader Ginsburg's health issues and her advanced age (she'll turn 86 next month), she is the odds-on favorite to be the next justice to depart the Supreme Court. However, she wants to hang on as long as is possible, something that Democrats wholeheartedly support. That means that if she becomes incapacitated, she may keep her seat until she shuffles off this mortal coil. Consequently, as the New Yorker's Jeffrey Toobin points out, it may be that the justice who is actually the most likely to depart next is...Clarence Thomas. The basic logic here is pretty simple. Thomas is not a spring chicken either (he's 70), and he's been on the Court longer than any of his colleagues (28 years). He is also notably unenthusiastic about the work, seeing it as a duty rather than a privilege. If he retires this year, he is certain to be replaced by a fire-breathing conservative. If he waits until 2020, the outcome is probably the same, although it will hurt the GOP a bit politically, as it will force Mitch McConnell to violate his "principle" of no SCOTUS confirmations in an election year (something the Majority Leader will undoubtedly gladly do, presumably concocting some sort of exception, like the rule doesn't apply in years where the Summer Olympics are in Asia). By 2021, however, Thomas and the GOP could be looking at a four- or eight- or even twelve-year wilderness, in terms of the White House. Does the Justice really want to try to hang on until he's in his eighties, particularly given that would take him into his fourth and possibly fifth decade of service in a job he doesn't enjoy? He is most certainly not among the frontrunners right now, but if you have to bet on a dark horse, you could do far worse. Background: In his half-century plus on the planet, Bennet has had quite a wild ride. His grandfather worked for FDR, and his father was in the diplomatic service, with the result that the Senator was born in New Delhi, India. The family returned to a series of postings in Washington, DC, and so that is where Bennet spent most of his formative years. Though he struggled as a student, eventually being diagnosed with dyslexia, he took a BA in history from Wesleyan University, making him the third generation of the family to attend that school. He then had a brilliant career at Yale Law, where he served as editor in chief of the law journal. After graduation, Bennet was all over the place, doing a wide variety of private- and public-sector jobs. Among the non-political stops on his journey were clerking for the U.S. Fourth Circuit Court of Appeals and working for seven years as director of the Anschutz Investment Company, where he managed to save several billion-dollar companies from going under. 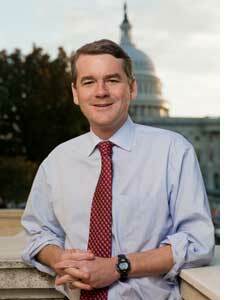 Political Experience: Like his father and grandfather, Bennet served in a number of advisory and appointed positions. He was Counsel to the Deputy Attorney General during the Clinton administration, served as chief of staff to Denver mayor (later Colorado governor) John Hickenlooper, and then had a four-year run as superintendent of Denver Public Schools. Educationally, those four years went pretty well. Financially, not so much, as a bond issue that Bennet lobbied for went poorly and the interest payments ended up being much more expensive than expected. He avoided having to deal with the fallout, however, as he was appointed by then-governor Bill Ritter to fill the U.S. Senate seat vacated by Ken Salazar (who left to become Barack Obama's Secretary of the Interior). In other words, Bennet managed to make it all the way to the United States Senate without his name ever having appeared on a ballot. He did win re-election in his own right in 2010, and was reelected in 2016. Signature Issue(s): Although he and his wife are both noted environmental activists, every Democratic candidate is going to be talking green this year. So, the issue that would be more distinctive is education; Bennet has a fair bit of expertise, and could spend much time lamenting what Betsy DeVos has been doing as Secretary of Education. Instructive Quote: During the clip linked below, and in reference to an immigration bill that got through the Senate but died in the House: "That bill passed the Senate, but it couldn't get a vote in the House, because of the stupidest rule ever created, called the Hastert rule, named after somebody that is IN PRISON!" Completely Trivial Fact: Bennet's brother James runs the op-ed page for the New York Times. One can already imagine what the Rush Limbaughs and Sean Hannitys of the world would do with that. Recent News: A few weeks ago, a clip of an emotional Bennet blasting Sen. Ted Cruz (and, more broadly, the GOP) over the government shutdown went viral. More recently, Denver teachers went on strike; some saw that as a product of Bennet's not-so-successful bond initiative. Three Biggest Pros: (1) He's a shrewd political operator, and no less an expert than Barack Obama described him as a "gifted Democratic politician"; (2) He comes from a swing(ish) state and has mostly centrist positions that will appeal to independents and possibly Midwesterners; and (3) For those who like to break down barriers with their votes, Bennet would be the first Jewish president. Three Biggest Cons: (1) He is simply not telegenic, and even in the viral clip above, he speaks with an odd cadence and wanders around the Senate floor with his arms crossed; (2) His positions on the issues mean that there's something there for everyone to like, but it also means there's something there for everyone to dislike—for example, he has a C+ from the NRA, which is the kind of grade that leaves partisans on either side of the gun control debate unhappy; and (3) His record is actually pretty thin; in a decade in the Senate, he has sponsored a grand total of one bill that became law ("A bill to revise the Federal charter for the Blue Star Mothers of America, Inc. to reflect a change in eligibility requirements for membership"). Is He Actually Running? : He appeared on "Meet the Press" this week and gave the kind of interview, in which he talked about what the Democrats need to do to win in 2020, that aspiring candidates tend to give. He's also going to visit Iowa later this month, presumably not to negotiate a corn-for-Coors trade agreement. In other words, he may not be running yet, but he's definitely thinking about it. Betting Odds: He wasn't on the board before the Cruz missile; after that the books started to give 66-to-1 odds on him, which implies a 1.5% chance of landing the nomination. The Bottom Line: There's probably room for one person in the "centrist white guy from a Western state" lane. If Bennet can fill it, as opposed to his former boss Hickenlooper, or Steve Bullock of Montana, then he's got a shot. But that's a big if. Feb14 Might Mexico Pay for the Wall after All? Feb13 WWDD: What Will Donald Do? Feb13 Will Another Amy Run?